Here is the pink water lily! 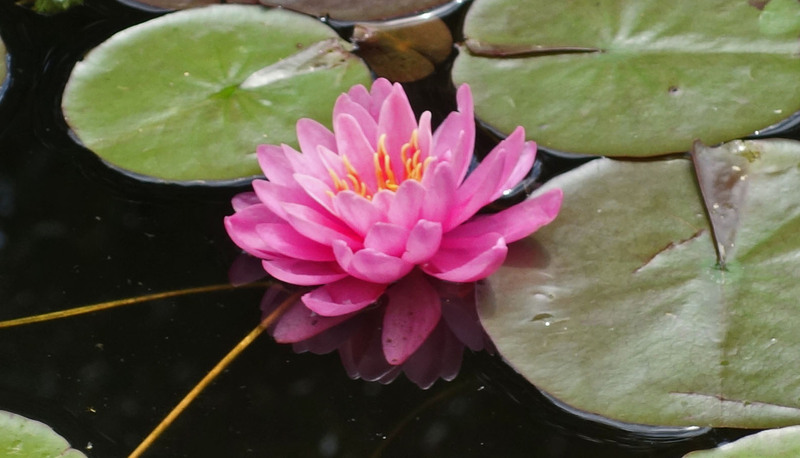 Pond – This is the first week that all three colors of my water lilies bloomed. It is just gorgeous. The week that was – Hazel had surgery this week. (That’s a total other story!) Talk about a household turning upside down. She is fine now but I did cancel some plans so I could concentrate on worrying. Locking down dates – This past week we scheduled a whole bunch of activities. Once the weather breaks everyone starts planning. I need another 4 weeks between July and September. Any suggestions? Ironic isn’t it? – We have a nest of catbirds. They are called cat birds because their language mimics cat sounds. We also have cats. This week I witnessed a catbird (who is grey colored just like Morgan) having a discussion with Morgan. It was very animated and amusing (for a human). Sure wish they would have posed for a picture. Where did that dumb bird go? Smart camera – You’ve heard people (like me) complain that their car, phone, etc. is smarter than they are. My camera is too. I did something that changed the viewing screen and couldn’t figure out how to get it back to normal. I did the normal “camera” thing. I gave it to the beloved husband to figure out. There is something about manual stuff that is easier. This entry was posted in For Animal Lovers Only, Humor, Random Five and tagged Activities, Anxiety, catbirds, Hazel, locking down dates, Morgan, pet surgery, pets, pond flowers, ponds, summer, water lilies by Kate Crimmins. Bookmark the permalink. How about we borrow the four weeks from January and add them onto July? You’re right, there’s never enough time in the summer! I love manual. Hate machines that try to think for me. Glad to hear that your cat is doing well. Just how many cats do you have, by the way? Currently I have 3. I had 4 but one passed last September. Sorry that Hazel had to have surgery and that she gained a pound. After I fell I gained 7 pounds! They are almost gone but I miss eating again. I love it when cats talk to the birds. Teddy has sharp words for the pigeons. Beautiful lily. Hazel spent days hiding so I don’t know how she gained the weight but she did! Hope your fall is firmly in your past! Fall is in the past and hopefully its relatives Trip and Stumble don’t think to visit me. Manual stuff is so much easier. I hate when my settings get messed up like that b/c I have to figure it out myself as hubby is tech impaired. Love the conversation between Morgan and the catbird. hahaha I can imagine: If I can get to you, bird, you better look out. Oh, yeah, dumb cat? Come on then! I dare ya! Do you know those secret cuss words? I keep wondering what they are. Mine are careful not to use them very often around me. Tiger just screams when kana goes near her, too upset to even form words. They are secret words. I’m pretty sure Morgan used them on the way to the vet this morning. Kana and Tiger and I are going this morning, too. I’m sure I will hear a few (but won’t recognize them), and they will save their truth wrath for the vet techs. In the vet’s office all of my cats are like “pussycats.” Quiet, no struggles, just scared. They are easy to pill while at home there is a struggle. 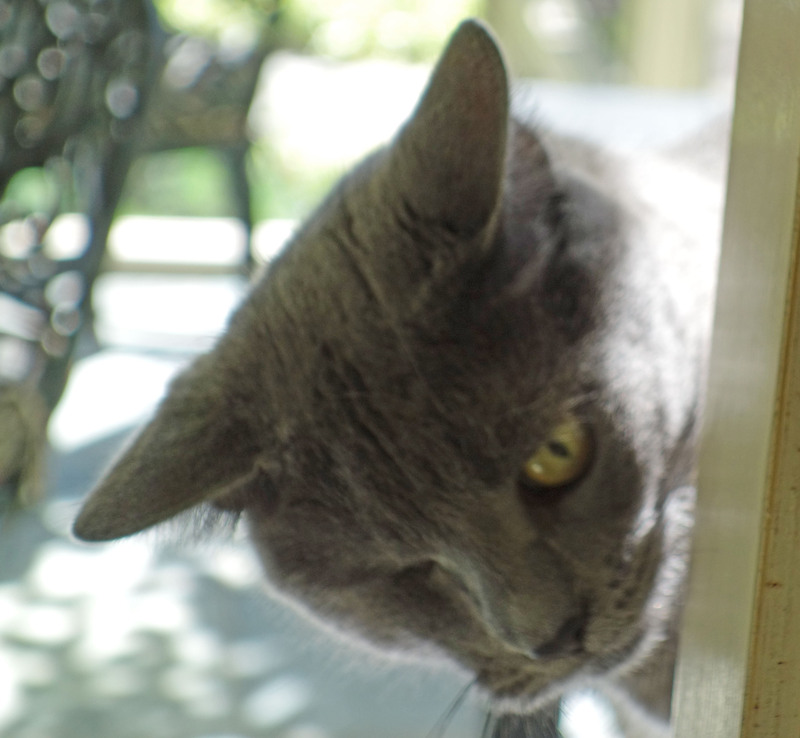 There is a saying down South here…”He (or she) is a catbird!” That means he is a cool dude. May your worries be over re Hazel and all be well in your part of the world. I think they are (Hazel) but she’s still milking it! All is well here but very warm. You are a woman after my own heart. I don’t know that I set aside time to worry, but I do it very well when needed. As to summer days, I’d suggest dividing days in half and scheduling things both morning and afternoon. If necessary, split days three ways. You might have to perform all activities in double or triple time. Maybe you can tell I’m a musician, used to practicing things too fast to get it done. Love the lily. Let’s just say there are more midday naps these days. 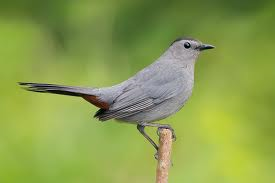 I’ve never seen a catbird! Thanks for sharing. Whenever a cat is outdoors here, the normal songs change to warning chirps. If a cat has escaped, I can usually triangulate their position by chirping intensity. When Jake was outside I could always tell where he was by the warning chirps and the intensity. With the indoor cats (inside a screened porch) they don’t warn so much. Glad that Hazel and you survived the week! Love the water lily. We had a good week ~ celebrated our 32nd Anniversary with jazz on the beach. Went for a walk on the beach this morning ~ gorgeous breeze and temps AND low humidity. Sounds like a perfect week! I’m glad to hear Hazel is doing better, Kate. Oh, I’m with you on the manual stuff. My camera is pretty basic, but it still drives me crazy when I hit a button and everything changes. I know. It takes hours just to figure out what you did. First things first…glad Hazel is out of ICU. Must have been hard on you after losing Jake to see her in distress. Now does she see why she needs to keep her weight down? Can I send something? Flowers, fruit, a mouse in a freezer Ziploc bag? Let me know. Love the picture of the lily. That new camera of yours is really wonderful. The picture of Morgan too. She’s got a Ginger Rogers thing goin on, just with gray hair, I mean fur. Love the line about her conversing with the catbird. So funny. Will look forward to more pond and porch stories. The season is young, after all. Much more important, I am out of ICU. I don’t do well when one of cats are out of sorts. This started as a routine dental and turned into a bigger deal. She is a wily one. After not eating for 2 days she did the sympathy thing. I fed her whatever she wanted and she promptly gained a pound. Now we have that to lose. Sigh! She’s the Liz Taylor of kitty cats, that Hazel. Yes. Putting Hazel on a diet is more painful for me than her! It’s that refugee look that tears you apart. That….how could you starve me this way, face. So glad Hazel is ok and Morgan made a new friend. A friend she would just love to get her paws on. As to needing four weeks between July and September I have a solution. Most people call it August, but I call it a living hell. You’re welcome to it. No! I meant 4 extra weeks besides August. Ok, I’ll try to take yours but I think they run concurrently just like a jail sentence. I can’t count the hours I’ve spent with my camera’s manual trying to figure out what I did without knowing it, and how to fix it. It is nature’s way of making me read the manual, I guess. The manual that came with my camera is not very good. My husband bought a separate instruction book that has been helpful. Considering how simply I use the camera, I can’t figure out how I changed up everything! It is so easy to push a knob or button this way or that…do it all the time. I don’t have a smart camera, but wish I did. You showed it how smart you are by letting hubby fix it. I am the technologically advanced person in the house except when it comes to cars and cameras. I don’t have the patience. He sat down with an instruction book (that he bought because the one that came with it was written by someone who had English as their 28th language) and within an hour or two he was able to give me a lesson. Now I’m happy again. I should write some of the stuff down. There is a menu, mode and tools icon. Hard to remember what is where. Honestly, I’m getting to where I have to take notes on everything, even where to find features on WordPress. Pitiful. Temperatures are to be over the century mark today again. We’ve had quite a string of over 90 degree days. It wears us out despite air conditioning. Next week’s not supposed to be any better. Yes, I believe in global warming. The heat wave is moving east. They are predicting 90 for today. We had some 90 degree weather about a month ago but since then it’s been seasonable to cool. I love it warm but a week of 90 is exhausting. I hate air conditioning. You need it when it’s that hot but the going in and out of the heat makes it worse. Some places over cool their stores and I find myself longing for my hoodie. We have a pair of catbirds nesting in our neighborhood. They remind me of mockingbirds, which I haven’t seen for a couple of years. Fund to watch. The pink waterlily is very pretty. Glad Hazel is fine after her surgery… I would have been worrying too, heck I am worried now for what happened to her. Cute picture of Morgan! Our week was HOT HOT HOT! Is it fall yet? Our weather was perfect although they are predicting a hot one this week. I may have to buy another pair of sandals!